JOHANNESBURG, July 27. /TASS/. Russian President Vladimir Putin said on Friday he was ready for another meeting with US President Donald Trump either in Washington or in the Russian capital of Moscow. 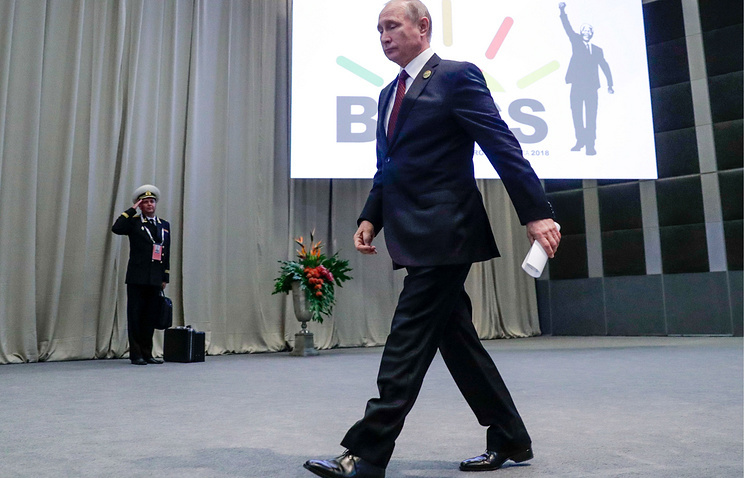 "We are ready to invite President Trump to Moscow, where, by the way, he had already been invited to, and I have already told him about this," Putin said addressing a news conference after the tenth BRICS (Brazil, Russia, India, China and South Africa) summit in Johannesburg. "I am also ready to travel to Washington, if appropriate conditions are in place for our work," the Russian president stressed. Putin added that both he and President Trump share the intention of holding another meeting following this month’s Helsinki summit. "It is important that appropriate conditions are in place for our meeting and such conditions must be arranged in our countries as well," Putin said. The Russian president said he would be having meetings with the US leader as part of international events, including at the G20 summit. "There are also plans to meet as part of international forums," Putin added. "So, despite all the complications, and in this case, the difficulties in US domestic political climate, life goes on and our contacts continue."